I don’t know if this is the first Kotlin Multiplatform app in the iOS store, but it’s our first Kotlin Multiplatform app in the iOS store! Technically we updated the existing Droidcon NYC/SF app, so the approval process was easier than a new app would be, but approved it was! I’ll be doing a few more talks through the remainder of 2018. 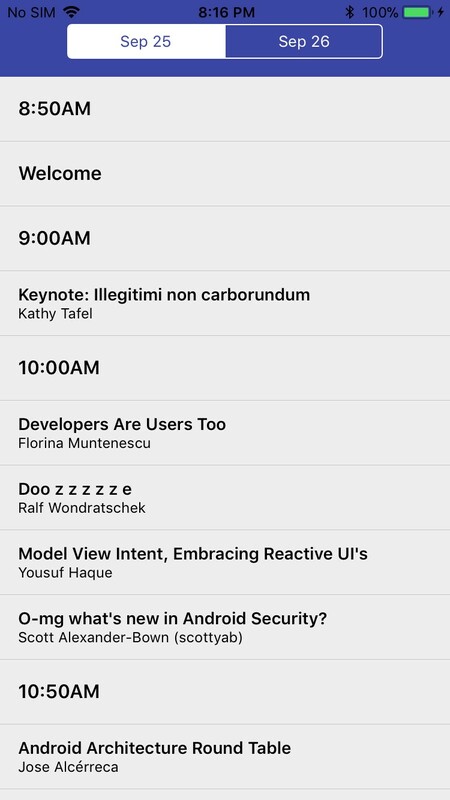 I’m most excited about KotlinConf, but will be doing a few other events as well. We still need to release the Android app. Sometime in the next couple days. The underlying libraries are being updated to Kotlin 1.3 eap as well as the latest Kotlin/Native builds. That should also be early this week. That will probably be it till after Droidcon NYC. Speaking of, today is the last day for standard price tickets (use code ‘kotlinmp’ for a discount)! Just a quick note about app size. We’ll write more about this later, but the summary is Kotlin/Native does really well with regards to download and install size vs other frameworks. The download size is under 10m. Our last version with J2objc was just under 30m. It had more images in it, but still. By comparison, we did the flutter sample a few months back, which came out to 20m. React Native kind of beat everybody, but anyway. Will need to make some bare-bones apps and do some comparisons. As always, Touchlab is looking for orgs that want to get started with this tech. Reach out. We’re gearing up to have our 4th year of Droidcon NYC! The talk selection committee just started voting, and we have an excellent lineup. Should be a great event. Because we’re a mobile dev shop, and mostly an Android shop, we’ve launched an Android app for the Android conference each year. Last year we used Doppl to create an iOS version of the app as well (Apple is pretty serious about not having Android in the app store, though). The current version of the Droidcon app started back in 2014. We used some early Kotlin, way way before that was a “thing”. However, in 2017, it’s some pretty old looking Kotlin. We also used some libraries and architectures that aren’t exactly current “best practice” by Android standards. There were also zero tests. So, you know. We want to have a nice, public example of a well designed Android app, the very modern architecture of which can then be used directly in iOS. We also want to train some more of our team on Doppl, and figured we’d do it publicly. Keep an eye on the Droidcon example app. We’ll be modifying a few things over the next few weeks. Back in 2009 or so, I was the person who did the Android port of ORMLite. In 2015 I wrote an annotation processing update of that. We used it internally, but there were too many DB libraries already, so it’s kind of abandoned. We’re moving the DB to Room (or maybe SQL Delight. See how it goes). I wrote a threading task queue a couple years ago. It was designed to be simple, and also implement a persisted queue for offline support. Everybody has kind of moved away from the “event bus” model over the past few years, so the non-persisted tasks will be implemented in RxJava 2. The persisted stuff will be backed by the Android Priority Job queue. Fun fact, Yigit did that and the Room DB stuff. Thanks, Yigit! The current app uses Retrofit v1. Doppl doesn’t have Retrofit v2 yet because we need Okhttp to support ssl, or we need a different call client. We’re going to move the Droidcon app to Retrofit v2 to sort of force the issue and prioritize sorting out the Retrofit v2 situation. We’ll be moving to the new architecture components, but probably using Rx instead of LiveData. I’m not sure right now how much of that will make sense in an iOS context. Obviously, we’ll need some implementation of the lifecycle stuff, but it won’t mean as much. That’s all still TBD. The general idea of Doppl is to move as much code as possible into the shared space, though, so hopefully, the architecture code makes sense. This year’s app will be simpler than previous years. We’re removing the “login” requirement. It doesn’t make all that much sense. The only feature loss to the user will be a lack of sharing RSVP’s between devices, which seems ridiculously unnecessary. This will simplify the code considerably, but should still deliver similar functionality and UX. This is my periodic “The Android community is awesome. So much love and feel so enriched as a person knowing y’all” silliness. OK. Carry on. Here at touchlab we could not agree more with Huyen and the many people on Twitter saying great things about this community. Droidcon NYC 2016 ended a few weeks ago, but it feels like yesterday and we already can’t wait for the next big community event. Thank you to everyone. To the attendees who were kind enough to trust that we would do our best to make it valuable to you. To the speakers who are generous enough to come and share their knowledge and experience. 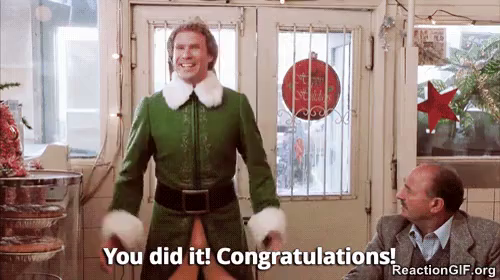 To the sponsors who are forward thinking enough to invest in the community and earn their gratitude. We appreciate you all, thank for coming. We were really grateful to hear all of your feedback afterward. You told us that Convene was the best venue yet, that the talks were stellar, and most importantly for us, you all had a great time. For many, it was a reunion of Android developers and designers scattered across the US and abroad, and we’re blessed to be able to bring you guys together every year. Head to our Facebook page. Below are links to each of the albums to make your life super easy. Please tag yourself and people you know! So, first things first. All the livestream videos are live right now on at droidcon.nyc for anyone with a ticket to the event. Just click through to the speakers page. But of course, what you really want is the final, edited, free version that’s going to be up on Youtube. Well good news, those will be live by the middle of November!! Even better news, we’ve got a bunch live right now. Check them out here. The final edited videos will be published in a few weeks on our touchlab YouTube channel, so subscribe if you want to get notified. These folks are the reason we could make this Android community conference happen. When it comes time to test out new tools or look for a new position or refer someone somewhere, please remember these great organizations and support them. mParticle is the the data platform for the world’s leading mobile apps. The top app businesses in retail, travel, social networking, gaming, streaming media, and more use mParticle to collect customer data once and send it to any analytics, marketing, and data warehouse platform. With its turnkey data connections and enrichment capabilities, enterprise-grade privacy and security safeguards, and business end-user friendly audience creation and management tool set, mParticle enables mobile-first companies to harness and act upon their data with greater agility, more control, and higher ROI. Learn more at mparticle.com or follow @mparticles on Twitter. Zendesk builds software for better customer relationships. It empowers organizations to improve customer engagement and better understand their customers. Zendesk products are easy to use and implement. They give organizations the flexibility to move quickly, focus on innovation, and scale with their growth. JW Player is a full-stack video solution that prioritizes speed, control, and reach across all viewing platforms. JW Player’s Android and iOS SDKs include native software classes and methods that enable you to build adaptive live and on-demand video playback, player UI customization, VAST3 and VPAID2 advertising, and other video features directly into any native mobile application. Thanks again everyone – see you next year!